Electron micrograph of crumpled sheets of molybdenum disulfide. A new paper from School of Engineering Professor Vincent Tung has made the cover of Advanced Materials, one of the top journals in materials science and engineering, and the research could one day lead to new sources of clean energy. Hydrogen has long been the holy grail of clean fuel. Unlike fossil fuels, which release planet-warming carbon and other harmful pollutants, the only byproduct of burning hydrogen is pure water. Scientists have spent years trying to unlock hydrogen’s clean fuel potential, but they have yet to develop cost-effective ways of generating hydrogen. Tung’s work brings science one step closer to that goal. Tung and his collaborators — Stanley Chou at Sandia National Lab, Chang-Ming Jiang and Ian Sharp at Lawrence Berkeley National Lab, Professor Andre Taylor at Yale University and Professor Lance Lian-Jong Li at King Abdullah University of Science and Technology — discovered a novel way to turn flattened 2-dimensional sheets of molybdenum disulfide (MoS2) into 3-dimensional crumpled structures, a transformation that boosts the material’s electrochemical activity, making it an excellent catalyst for hydrogen evolution reactions (HER), the chemical process that splits water into hydrogen and oxygen. HER is usually energy greedy — more energy goes into splitting water than is obtained from burning the hydrogen that’s released. That’s why catalysts that make the process energy efficient are in high demand. Tung’s work may one day help meet that demand, but understanding how requires a basic grasp of MoS2. Electron micrograph of stacked 2-D planes of molybdenum disulfide. 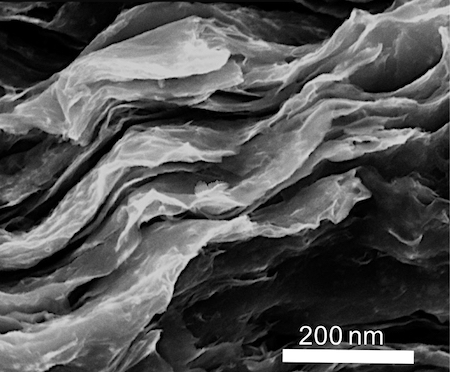 At the molecular level, molybdenum disulfide resembles a ream of paper. MoS2 molecules are chemically bonded to each other to form flat, rigid sheets (monolayers) that stack one on top of the other to form a bulky, layered structure. But from Tung’s perspective, layered MoS2 isn’t all that useful. Isolating MoS2 monolayers, however, was only the first of Tung’s challenges. To make flat sheets of MoS2 electrochemically active, Tung needed to deform them into shapes with edges, vertices and corners. Crumple a flat sheet of paper into a ball and you’ve turned a 2-D surface into a 3-D structure. That’s essentially what Tung and his team did with MoS2. But how did Tung go about crumpling monolayers of MoS2, which are only one molecule thick and 150 nanometers across? He exploited the power of water in the presence of electric fields. A single 2-D nanosheet is crumpled into a 3-D structure. Sheets of MoS2 are placed in tiny droplets of water. An electric field is then applied to the water, creating strong electrostatic forces that keep individual MoS2 sheets from restacking. As the water evaporates, the charge density in each droplet increases, ultimately rupturing the droplet into numerous smaller ones, a process that closely resembles cell division. As droplets divide, each droplet contains fewer sheets of MoS2, thus preserving the single-layer conformation and the desirable material properties. 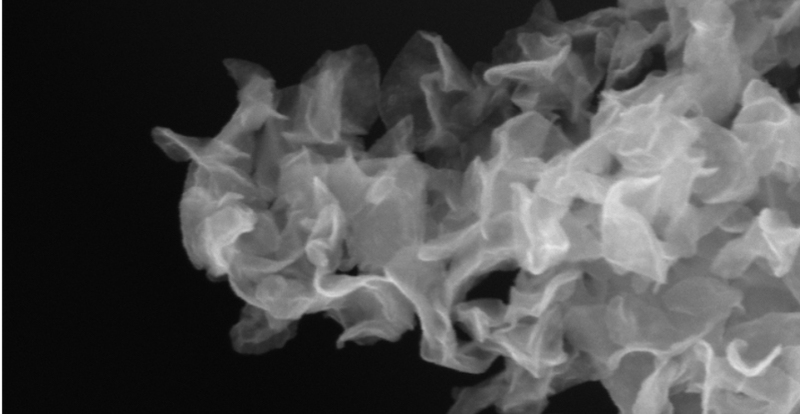 By the time the water evaporates completely, the capillary force is enough to deform the MoS2 sheets into crumpled, catalytically active balls. Just as important as the method itself is Tung’s finding that crumpled MoS2 is extremely stable. Sheets can be used for over 5,000 cycles of catalysis, they’re functional at temperatures in excess of 570 degrees Fahrenheit, and they’re catalytically active over a wide range of pHs. Tung’s method for molecular crumpling turns catalytically inactive sheets of MoS2 into hubs of electrochemical activity, making them excellent catalysts for producing hydrogen from water. Add their stability to the mix, and they become prime candidates for use in clean energy technologies. “This technique provides a new pathway to turn ordinary material into an exceptional catalyst with many applications,” Tung said.